PlayerUnknown, Fortnite, and the tension between ownership and iteration in video games. Last month, Rockstar released Motor Wars; a new mode in GTA Online in which 28 people skydive into a continually shrinking arena, as they scavenge for weapons and resources before fighting to the death in an effort to become the last person (or team) standing. Next week, Epic Games launches Battle Royale; a new mode in Fortnite in which 100 people skydive into a continually shrinking arena, as they scavenge for weapons and resources before fighting to the death in an effort to become the last person (or team) standing. And in 2018, Automaton Games will release Project X; a new multiplayer game in which 400 people skydive into a continually shrinking arena, as they scavenge for weapons and resources before fighting to the death in an effort to become the last person (or team) standing. Obviously, I’m being intentionally reductive by glossing over the finer distinctions and variations found within each of these titles, but the overall implications are clear. The sky-high success of PlayerUnknown’s Battlegrounds has led to what always happens whenever a particular type of game makes an inordinate amount of money; a rapid proliferation in the number of unmistakable imitations. Many, including the PUBG devs themselves, are quick to disparage experiences like Fortnite Battle Royale and Project X as nothing more than shameless clones and, aside from the small fact that PUBG was hardly the first to offer its particular mode of gameplay (hello H1Z1, Minecraft and The Culling), it’s easy to understand where they’re coming from. While no one can deny the extent to which these games have explicitly and almost exclusively drawn from PlayerUnknown’s winning recipe of multiplayer madness, these clones aren’t as cheap as you might assume. In fact, to call them tired facsimiles would be to ignore the importance of what they represent; pieces of a wider puzzle that, once put together, can bring into existence an entirely new genre of video games. In his brilliant video essay on the subject of souls-likes, Mark Brown accurately outlines the four steps involved in the birth of a new video game genre. There’s the success of an innovative game, the cloning of said game by other devs, the process by which each clone offers increasingly radical tweaks to the template set by its inspiration, followed by the realization that these games aren’t even clones anymore, but original titles all belonging to the same genre that they helped define. Take a look back through video game history, and you can see this process of ‘genrification’ (a word I definitely didn’t just make up) occurring all the time, whether it’s the case of Doom and the first-person shooter, Minecraft and the voxel genre or, more recently, Dark Souls and its bountiful offspring of souls-likes. It seems to me that battle royale is currently in stage two of this process, whereby the lucrative success of PUBG has spawned a cacophony of copycats which, for the most part, stick fairly close to the design mould established by that PC mega hit. That lack of innovation during this season of battle royale's genrification (again, a definitely not made up word) is expected. If the idea ain’t broke and, more importantly, it’s selling like hot cakes, why change it? But, as time goes on and the novelty of PUBG wears off for those outside of its dedicated fanbase, there’ll be a ready demand for fresh ideas within the framework of battle royale. Even with their creative inhibitions, you can already see the way in which current impersonations are offering minor tweaks to the norm, thus setting off the rolling snowball of genre iteration. Fortnite Battle Royale brings crafting elements and a Saturday morning cartoon sense of humour to show that the genre doesn’t necessarily need to have the aesthetic militarism of PUBG for a tactically rewarding experience. 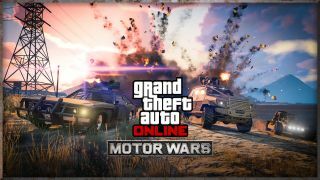 GTA Online’s “Motor Wars” focuses on tight teamplay, which lends credence to the idea that small player counts in battle royale can be just as intense and enrapturing as fights against combatants numbering in the hundreds. On the polar end of that, the upcoming Project X suggests there’s no limits to just how big battle royale can get in future, and I can already picture the next Battlefield game offering last-man-standing tournaments at the operatic scale that the series is already synonymous with. At this early a stage in its lifespan, it’s hard to accurately outline the key characteristics immutable to the identity of the genre; those elements shared by every battle royale game, no matter how far they diverge from expectations. While last-man-standing PvP remains an indefinite cornerstone of the experience, who’s to say whether the tradition of skydiving into the battle zone will always be considered a sacred genre staple? The same could be said about the third-person/first-person perspective of PUBG. I see no reason why battle royale couldn’t take place in a top-down twin-stick shooter, for instance, and the unique characteristics of already existing gameplay frameworks like these allow for greater opportunity to play around with the paradigms of the genre. I could be wrong about all of this. Maybe I’ve misinterpreted a fleeting fad for the consolidation of a brand new type of video game but, as PUBG continues to surge in popularity at record-breaking levels, dismissing the phenomenon as nothing more than an isolated phase with little lasting impact becomes less and less convincing. Epic Games and Rockstar are likely only the first major developers to jump in on the trend, too, so don’t be surprised if you see battle royale modes making their way into your multiplayer games in future. At the very least, I think we can bank on battle royale becoming ubiquitous to online gaming in future (think Team Deathmatch or Capture the Flag), even if it never turns into a fully fledged genre of games. Say what you want about the PUBG copycats of today, but can you really fault the developers for recognizing a new, innovative slice of gaming with worldwide appeal and attempting to transplant that unique brand of entertainment into their own projects? The early work of genrification (okay, I totally made it up) is always the hardest, as those games which first begin to tepidly play around with a new blueprint are up against a tough crowd. Games like Fortnite are therefore worth appreciating for their secretly crucial contributions to an industry that automatically views them with suspicion. Think of it not as plagiarism, but as another cobblestone in the footpath towards greater iteration; the grinding of the first cogs in a piecemeal process that could end up changing the face of the medium itself. This long-running pattern of industry progress is something that can only be appreciated either in hindsight, or by taking a step back to understand the whole picture. But it’s a perspective which highlights the underestimated importance of the dissemination of ideas, not least in one of the most iterative industries in modern entertainment.